Hey, it’s 2013…when did that happen?!? In 2012, I graduated from culinary school, volunteered for Share Our Strength/Cooking Matters, started teaching cooking independently, then got a job with the Arkansas Department of Human Services as a chef instructor. That last bit is a grant-funded, most likely temporary gig, but while it’s here, I’ve been traveling from one city to the next in Arkansas like a mad woman, again teaching Cooking Matters. I’m teaching with a fantastic group of nutritionists from DHS who give me hope for the future of eating right. For as long as the grants hold out, I’m sticking with a great team. My other, more ambitious goal for 2013? I’m not sure I can share it just yet. Let’s just say there are a few influential people in town who happen to have some of the same dreams I have had for a while. And a goal is just a dream with a deadline, right? Oh, and I will eat better, too. Even those of us preaching the gospel of whole-food eating can re-learn a lesson or two. I desperately need to cut down on sugar and add some superfoods and extra nutrients back in. (New thing I just read and will try: L-glutamine may help reduce sugar cravings.) I may post my routine once I get it down; it’s mostly the same as what pulled me out of MS/lupus-like symptoms about 15 years ago. Ugh, and I still have loads of my homemade marshmallows and gluten-free Christmas cookies to finish off! I’m not really big on resolutions, but I do aim to be the absolutely best me I can be this year. Less coasting. More reading, planning, dreaming, taking action. And I must let myself rest, too. I still crash when I push too hard. Meanwhile, here’s a useless but fun wrap-up of all that went on here at Fancy Pants Foodie in 2012. 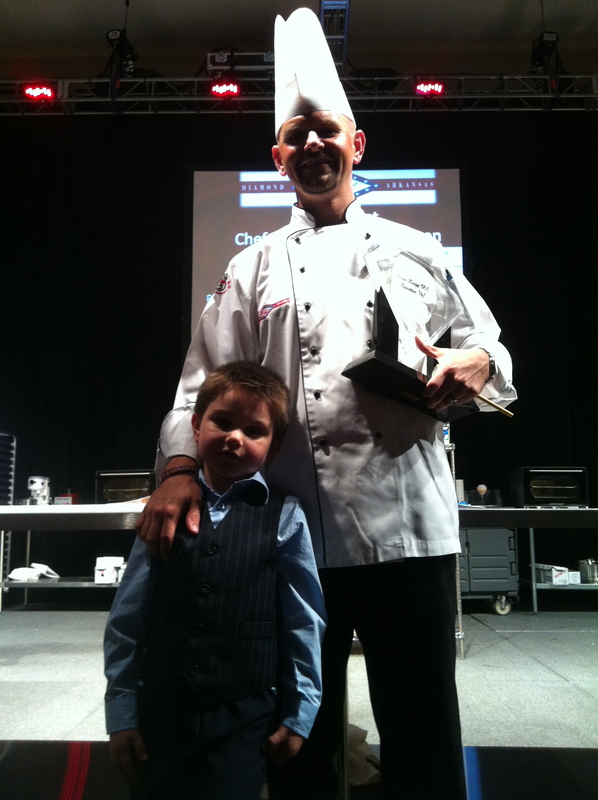 See if you or your favorite chef or event were one of the things that brought people here! 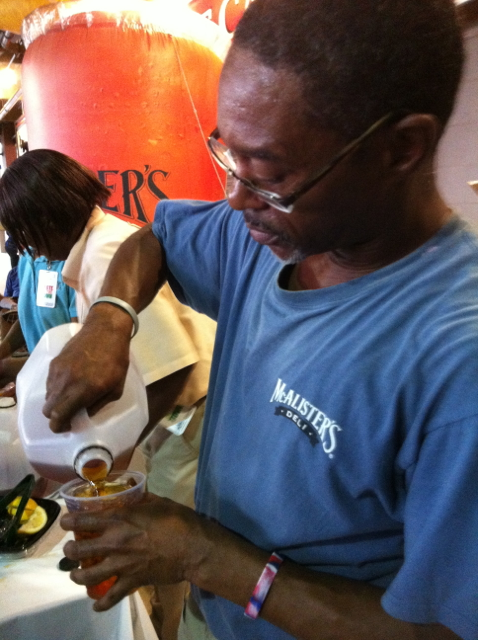 Rickey Townsend of McAlisters Deli serves up a cup of the restaurant’s famous sweet tea. Last Thursday, Dickey-Stephens Park stuffed itself and its guests with the best of North Little Rock’s restaurants at the 19th annual Taste of the Town food show, hosted by the city’s chamber of commerce. This event usually acts as the calendar caboose to several more upscale food events of the season, such as Wildwood’s Wine and Food Festival. However, this event is far better attended and represents what most of us eat on a normal night out, showcasing the very best dishes from the mid-range caterers and restaurants of my fair city. I’ve had an interest in this neighborhood grocery/deli since before it opened in 2010, so I was glad to see them there. Recent and repeated changes in the chef position caused some worry in the foodie community about the quality of food coming out. My reaction to their three samples: hit and miss. 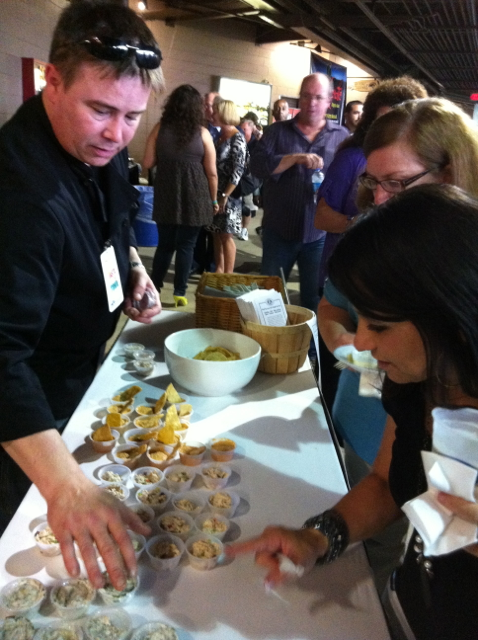 Argenta Market Assistant Kitchen Manager Greg Dooley helps guests with samples of their items. Their artichoke and spinach dip was superb, with a nice acid artichoke bite, flavorful spinach and balanced, creamy base. I could go through a whole bowl of this with no problem. The smoked chicken salad was just meh, not anywhere near what I had tasted from a similar dish by Scallions a few nights earlier. The smoke came through okay, but the meat was a bit dry and underseasoned, needing a bit more of mayo or dressing of some sort, nuts, grapes or something. The complete miss was the roasted red pepper hummus, which is usually one of my favorite snacks. It was painfully bland and overpowered by the taste of tahini, possibly needing a splash of lemon or maybe just more salt. Knowing the history of the operation and how hard it is to prepare little cups of something that’s as good as in the restaurant, though, I’ll cut them a break and come back for more sometime. But I probably won’t order the hummus. 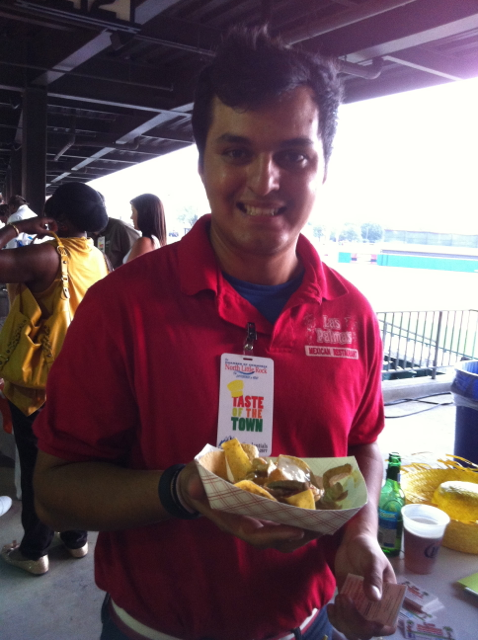 Luis Atilano of Las Palmas displays the restaurant’s fajita nachos. Ah, Las Palmas. The very mention of the name sends my 10-year-old into a spinning frenzy of taco-love. And yes, their versions of Americanized Mexican are my favorite among the long-standing local restaurant families in town. More recently, Las Palmas has started serving a small sampling of truly Mexican fare (usually only listed on a marker board), such as sopes and tacos de lengua. Note: Las Palmas is closing their JFK Boulevard location due to low traffic. My favorite server at JFK, Luis Atilano (pictured), will now have to let me practice my limited Spanish on him at McCain. Although I didn’t eat the wares from Verizon Arena’s foodservice team, I had to give them a shoutout. North Little Rock Taste of the Town is the only food event (that I attend, anyway) where I regularly see these chefs, and it’s too bad, because they’re masterful. 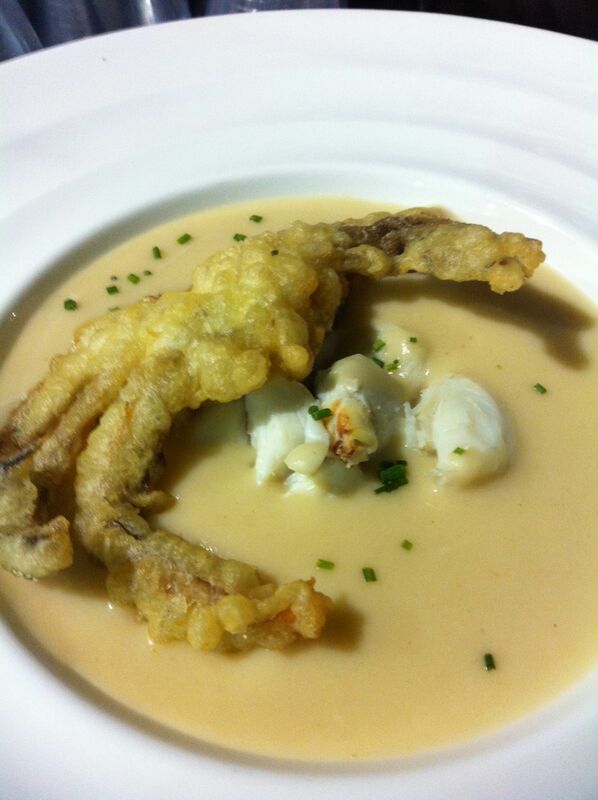 Who would have thought that an arena would have chefs on the level of some of our area’s upscale restaurants? The Verizon staff offered tiny BBQ spuds and a summer ambrosia with grilled pancake. Every single sample was perfectly coiffed and worthy of any food show. The potatoes showed how they could take something very simple and make it upscale, and the dessert was, well, just showing off. Unfortunately, Bedford hasn’t sponsored me yet with a nice camera (hint hint), and my iPhone didn’t capture the dishes in the funky light. You’ll have to take my word for it. If you have the opportunity to host an event at Verizon and utilize this staff, do so. The carnitas taco from Santo Coyote. On the more mid-upscale end of North Little Rock Mexican is Santo Coyote. Yes, it’s a large chain, but so were many of the vendors at the event. I hesitated to list two from the same genre, but Coyote’s offerings were superb and worthy of mention. 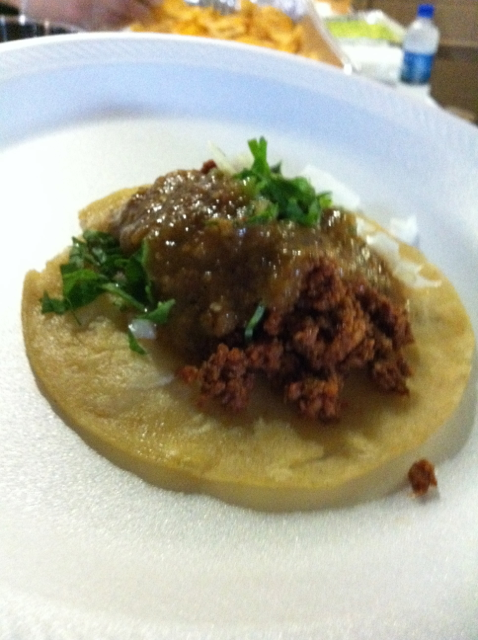 They offered a plate of two small traditional Mexican tacos, carnitas and chorizo, served on smallish soft corn tortillas. (If you order tacos at any legitimate taco truck, this is the style you’re going to get, rather than the Americanized crunchy kind.) Guests could also try sample cups of Santo Coyote’s well-known house-made guacamole and their cheese dip. Adorned simply with just a bit of lettuce and fresh onion, the tacos were something to behold. What truly guilded them was the two kinds of salsa, the “Salsa Morita” (acidic and sweet) and “Salsa Picosa” (hot and spicy). The latter made my eyes water, but the fresh, vibrant flavors throughout were worth it. As usual, if I got something wrong, forgive me and let me know. All my notes from events like this tend to swarm! An extended weekend of food, drink, music and art began today (Thursday, July 12) in the pleasantly beatnik town of Eureka Springs for the second annual Fleur Delicious Weekend. The event continues through Sunday, July 15. The city, already known for its narrow streets, Victorian architecture and carefree attitude, has added several degrees of French-themed fun. Several area restaurants will feature French food and specials, and the streets will be active with live music, shopping and activities. Some related events have already taken place, including one I wish I could have attended: “Uniquely Edible Arkansas” at the Dairy Hollow Writers Colony on Tuesday featured fellow blogger Kat Robinson, my former chef instructor Andre Poirot of the Peabody Hotel, and Margie Roelands of Raimondo Family Winery. I’ll be participating by cooking — or getting in the way, depending on how things go — alongside the more experienced KJ Zumwalt and crew at Caribe Restaurant y Cantina (link is a fantastic story by the aforementioned Kat Robinson) on Saturday night. So if you’re in town, come have dinner with us and see how it goes. Several hotels are offering specials for the weekend, so be sure to ask. And check the event’s Facebook page for up-to-the-minute photos and information. I somehow feel morally obligated, as a blogger type, to write a new year’s post. Most likely, it’s just a way to force myself into completing a post in one sitting, as I’ve got about a dozen half-finished ones waiting in my drafts folder. But, there is indeed some usefulness in the exercise. I’m about to finish my degree in culinary arts from Pulaski Technical College Arkansas Culinary School, and the time is right to lay out some plans, or at least some intentions. Resolution #1: Get friggin’ healthy, once and for all. Even after cutting out gluten and reaping the benefits in reduced muscle pain and fatigue, other stuff has cropped up. Last doctor visit, my thyroid and liver were out of whack, and I feel like total crap. New meds just have me feeling worse. This week, I’m taking my bod hostage and it’s gonna listen. Healthy meal plans (including shopping lists and scheduled time to cook) and a little bit of exercise — I seriously have no capacity for more — start now. I’m going to study Chinese and Indian medicine, especially their use of food. And tomorrow, I’m calling the fabulous acupuncturist I used to see years ago, who can cut through all the rigamarole of Western medicine that has left me hanging. Resolution #2: Talk less about my health. If I haven’t lost you already: Talking about one’s own health is boring, and it’s rude to those who have it worse. I think the reason I do it is just to let people know why I missed school/church/that lunch date/big event/whatever, or why I don’t commit myself to much these days. But I do plan to share stories with you about food and how it relates to health. Resolution #3: Teach. I adore helping other people learn how to cook for themselves, whether that is here on the blog or in person. Over the past year or two, I’ve had the opportunity to teach groups of children, moms on a weekend retreat, and many individuals. I hope to add group lessons in my own home, and maybe eventually in my own facility. I also want to get involved teaching in programs like Cooking Matters, which is just getting started in Arkansas. Turns out that two of my chef instructors at school are involved already. I don’t have the cred that they do, but I would love to get there. Resolution #4: Learn. I still have two more classes at Pulaski Technical College Arkansas Culinary School (American Regional Cuisine and, for fun, Cake Decorating), so obviously I’ll learn plenty there this year. But I plan to do my own schooling, too. As I’ve mentioned before, I’ve never worked in the foodservice industry, other than on my own. I still have stuff to learn from others. But rather than get a long-term job somewhere, I plan to “stage” (pronounced stahzj) several different places. I might even just take you along. Stay tuned for all that. Resolution #5: Be open to opportunity, and be wise in choosing. As I’ve come closer to my graduation, I’ve had all kinds of plans in mind, mostly pretty elaborate, expensive ones. A few months back, though, I decided to hang back and see what comes up, mainly to commit to a great year with my son before he starts kindergarten. This has been a good policy, because several things have come up. Now, I’ll just have to choose and balance them wisely, keeping both my family and you, dear foodie reader, in mind.